These days, it seems like there’s an advertisement for a cleaning service everywhere you go: billboards, van decals, television commercials, service-based websites. But are home cleaning services really that popular? With more people balancing their careers and family, many don’t have the time it takes to maintain an orderly home on their own. 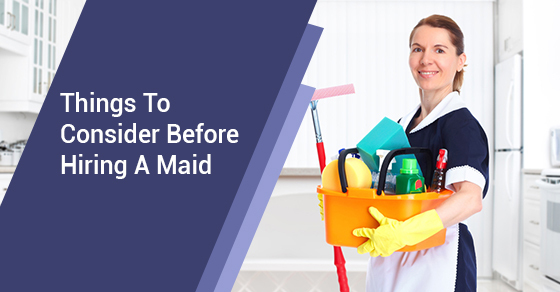 Some casual help around the house can be a big help, but there are a few things that you should consider before taking the plunge and hiring a maid. If you have a busy lifestyle, feel crunched for time, or just don’t know what to do, then consider these 7 factors before hiring a maid. First things first: you have to figure out if you can afford a maid before you hire one. If you can, great! Skip on down to number two. But if you aren’t sure whether or not you can squeeze it into the budget, then this one’s for you. The cost for a maid can vary, and can put a strain on your budget. If you really need a maid but aren’t sure if you can afford it, consider shuffling the budget around. Maybe only go out to eat once a month instead of every week. Or maybe you can make coffee at home instead of grabbing one on the way to work. You can also reevaluate how often you’d need cleaning services. If once a week sounds a little excessive, you can also schedule a deep cleaning once every month or two. No matter your cleaning needs, a cleaning service or individual can typically adapt to your schedule. If you have a smaller house, chances are you can clean it up quickly enough to negate any positives you might have from hiring a maid. Why pay someone over a hundred dollars to clean what you could’ve done in an hour? If it’ll take over 8 hours, however, it might be worth your time to consider hiring a maid. Divide your salary per hour at work to figure out your base salary. Then figure out just how much time you spend on menial tasks like cleaning the floorboards, folding laundry, and scrubbing the toilet. You might find that hiring help will cost less than if you were to pay yourself to do these things — and imagine what you can do with all that free time! Dishes piled sky high in the kitchen? Can’t find a single clean thing to wear? And when was the last time you vacuumed? If it seems like things get worse no matter how much time you’ve poured into tidying up, you should think about hiring a cleaning service. They can pop in and help you tackle the things that seem never-ending in just a matter of hours. However, if you simply don’t want to do those dishes or dread vacuuming for some reason, it may not be worth the money to hire help for such a short amount of time. Wake up, work, get home, clean, squeeze in a second to eat dinner, sleep, repeat. If this sounds like you, then it’s probably time to contact a maid. Cleaning services are a great way to free up a little bit of your time for the more important things. When you don’t have to worry so much about washing clothes and bleaching the bathtub, you have time to take up a hobby or learn a new recipe instead of munching on quick minute meals. You can also even take a nap if you want — yes, a nap! If that sounds like a dream come true, then a cleaning service is the right choice for you. When it comes to hiring a cleaning service, there are many different pros and cons that come with choosing an individual contractor versus someone from a large corporation. Individual cleaners are more likely to have a flexible schedule for regular clients or one-time cleanings. Corporate companies, on the other hand, have more safeguards in place to ensure only the most trustworthy maids enter your home. In short, corporations are best if you desire background checks and usually some form of insurance coverage, whereas individuals are the best option for saving money and flexibility. Do you hate cleaning? Groan at the thought of sweeping out that corner again? Not everyone can be a cleaning superstar—and that’s okay! There are professionals out there who can do it to perfection while you’re off doing the things that really make you happy. This is also a great choice for families with young children. If it seems like every time you put the toys away they’re back on the floor seconds later, it’s probably a good time to hire some help. A maid can tidy up while you and the kids are out at the park or running errands. Maybe you aren’t looking for a maid long term. Or maybe you are, but you don’t want one to stop by very often. Either way, many maid services are flexible enough to adjust to your needs. If you’re going to be hosting an event or dinner, preparing to sell your house, or even just need a one-time visit, consider scheduling a special occasion maid. For more information about how a cleaning service can help make your life a little easier, call Sunrise-cleaning at 289-814-1824 or contact us here.